Brenda graduated from Michigan State University, one of the first veterinary technician programs in the United States. She has worked in private practice, a university anesthesia department, and specialty practices during her career. She is not only a board member at large of the Academy of Veterinary Technicians in Anesthesia and Analgesia, but also a member of the academy’s examination, preapplication, and conference committees. She is married to Doug, a retired veterinarian, with three grown children and a growing number of grandchildren! Doug and Brenda share their house with a rescue Westie mix. Brenda is a frequent speaker at major conferences and teaches online anesthesia classes. In her spare time, she likes to rollerblade and read nonfiction. Hypothermia is a common yet preventable side effect of anesthesia and surgery. Too often, intraoperative hypothermia is overlooked or ignored.1 Unfortunately, many practices become accustomed to intraoperative and postoperative hypothermia because it is so common, or they are unaware that their patients are experiencing hypothermia because of lack of monitoring. However, just because patients routinely experience hypothermia does not make it acceptable. In this article, I will describe hypothermia dangers, causes, and risk factors; how to prevent or detect hypothermia; and how to treat it should it occur. Information obtained from reference 1. Why Is Hypothermia a Concern? Information obtained from reference 5. Before hypothermia can be addressed, you must recognize why the patient is losing heat. The main causes are cold environment, altered thermoregulation of the body, and heat-loss mechanisms. Exposure to a cold environment is the most common cause of hypothermia.5 Environmental temperature is often beyond the technician’s control. For their own comfort, many surgeons prefer a cooler environment while gowned. Alteration of the patient’s normal thermoregulatory response is the second most common cause of hypothermia.5 This alteration may be caused by agents used in anesthesia but alone is not a reason to change the protocol; the benefits of these agents outweigh their potential side effects. In an awake patient, body heat is not distributed uniformly. 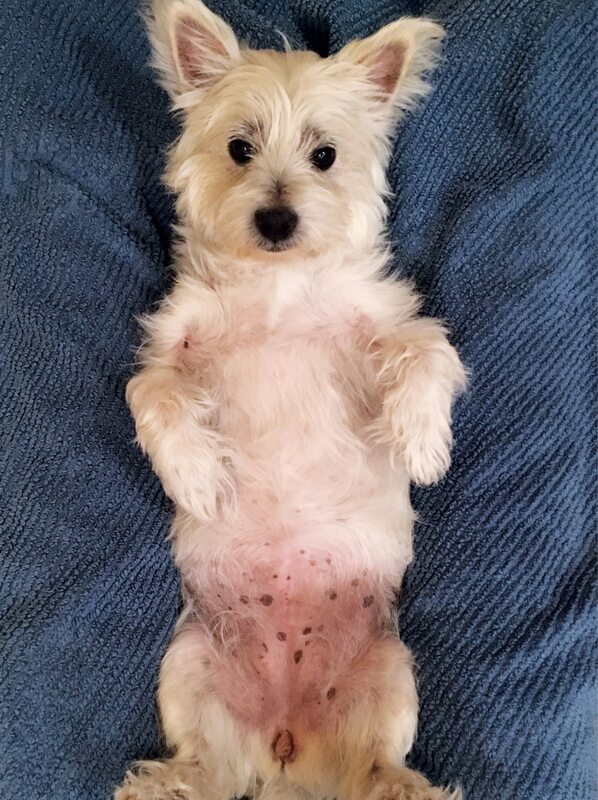 The periphery (tail, legs) release or absorb heat as needed to maintain normothermia.2 During the first hour of anesthesia, a centrally mediated decrease in temperature threshold causes the body to redistribute blood flow to the periphery to compensate for the body’s misconception of excess heat, resulting in a drop in core body temperature.2 Many other physical factors contribute to heat loss during surgery, including lack of body fat, large body surface areas, vasodilation,6,7 and changes to hypothalamus function. Specific vasodilatory agents commonly used in anesthesia are acepromazine and gas inhalants. Gas inhalants cause dose-related vasodilation: the higher the vaporizer setting, the more vasodilation will occur and, thus, the potential for hypothermia will increase. Heat loss can be categorized by mechanism. The 4 mechanisms are radiation, convection, conduction, and evaporation. Radiation: In the anesthetized patient, the most common mechanism for heat loss is radiation.2 Radiation occurs when an exchange of heat takes place between the body and environmental objects that are not actually in contact with the patient, independent of moving air. There is a loss of energy by transfer of infrared waves.2 Body heat, especially if the patient is experiencing vasodilation, is transferred to the cooler air surrounding it (eg, the heat dissipates away from the body). Convection: The second most common mechanism of heat loss is convection,2 which occurs as body heat is transferred to the air moving over the skin surface.2 The larger the body surface area, the more prone the patient is to hypothermia. In veterinary patients, although hair helps insulate the body to some degree, heat loss is accelerated from areas of exposed skin where the hair has been shaved. A shaved area or open body cavity can create extreme heat loss. Conduction: The transfer of body heat to a cooler surface is called conduction and occurs when any part of the body touches a cool surface. For example, conduction occurs when a patient is placed on a metal table or when a footpad touches a metal IV pole. To prevent heat loss from conduction, ensure that the patient is fully insulated from any cool object. Which Patients Are at Highest Risk? Among surgical procedures that promote hypothermia, those that promote the most heat loss involve open abdominal or thoracic cavities. These surgical patients will be at higher risk for heat loss while under anesthesia. What Is the Connection Between Anesthesia and Hypothermia? Although the patients listed above are at higher risk, all patients under anesthesia probably experience some degree of hypothermia. Overall, anesthesia decreases the basal metabolic rate by anywhere from 15% to 40%, which inhibits muscular activity and leads to decreased heat production.5 Inhalant gasses and injectable drugs can contribute to hypothermia. Some anesthetic drugs can lead to vasodilation, which can contribute to hypothermia. Fully dilated blood vessels lose heat 8 times faster than fully constricted vessels.5 Two of the most common vasodilatory drugs used in anesthesia are acepromazine and gas inhalants. It is important to remember that vasodilation caused by gas inhalants is dose dependent. Body temperature can be conserved by incorporating a multimodal anesthesia protocol allowing the vaporizer to be set at the lowest acceptable level for surgery. Thermoregulation can be altered by drugs such as alpha-2 agonists (dexmedetomidine), opioids, (hydromorphone, morphine, oxymorphone, fentanyl, and methadone), and gas inhalants.6 In humans, a temperature drop of 3.6°F to 5.4°F doubles the duration of nondepolarizing neuromuscular blocking agents.2 These effects do not indicate that these drugs should not be used in veterinary patients. Rather, they indicate that you should be aware of them and should plan interventions to prevent heat loss in these patients. Preventing hypothermia involves consideration of several factors: common sense, mechanical intervention, and use of everyday objects that may be around a clinic. If your patients routinely have been experiencing hypothermia, you should try to understand when and how the heat loss is occurring, keeping in mind that using a multimodal approach will result in the best outcome (TABLE 3). WARM RECEPTION When the patient arrives avoid patient contact with metal surfaces. Conduction occurs when a patient is placed on a metal table or when a footpad touches a metal IV pole. To prevent heat loss from conduction, ensure that the patient is fully insulated from any cool object. Heat loss is prevented by placing a blanket between the metal table and patient. Temperature should be monitored from the time of premedication until the patient is well into recovery. Ideally, the patient’s temperature should be obtained at intake, before leaving the prep area, continuously during surgery, and postoperatively until the patient has maintained a normal body temperature for 2 to 3 consecutive hours. Every patient needs a warm environment from the time it receives premedication until it is fully recovered. We will now discuss heat-loss prevention according to surgical phase: preoperative, intraoperative, and postoperative. FIGURE 1. Layers, Hug-U-Vac, warm water blanket, huck pad. Image courtesy of Brenda Feller. Surgical preparation can be a time of significant loss of body temperature. It is not unusual for a patient to lose up to 2.0°F during the first hour of anesthesia.6 To prevent heat loss during this phase, the patient should be insulated from cold surfaces. 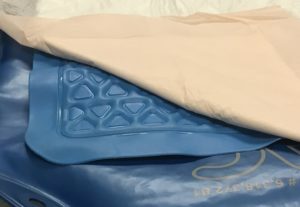 Techniques include padding the cage or run so the patient is not lying on a cold surface after premedication has been administered, padding the prep and surgery tables with bubble wrap and towels, and even ensuring that footpads are not touching cold surfaces such as an IV pole (FIGURE 1). The choice of scrub solutions can also contribute to heat loss. For most preparations, the initial surgical scrub used in the prep area can be warmed. If the patient is at a higher risk for hypothermia, substituting warm sterile saline for alcohol will help reduce heat loss.6 Do not oversaturate the patient. Being prepared and preparing the patient quickly and efficiently can help reduce heat loss. The best defense against intraoperative hypothermia is use of an active multimodal approach. Maintaining body heat is much easier than regaining it after it is lost. 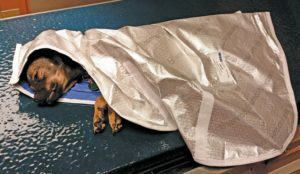 There are 4 types of active, or mechanical, methods of warming an anesthetized patient that are approved for use with veterinary patients: inline fluid warmers, forced warm air systems, conductive fabrics, and circulating warm water blankets. These 4 methods are routinely used in human medicine and have proven effective and safe when used as directed. FIGURE 2. 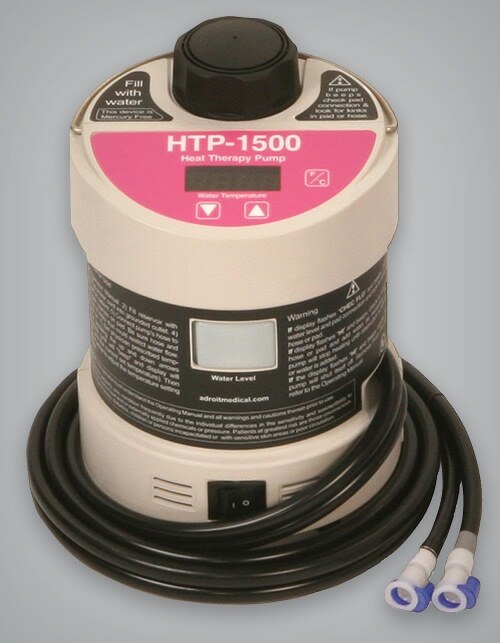 Inline fluid warmer. Image courtesy of Brenda Feller. An inline fluid warmer keeps IV fluids warm as they enter the patient and can be used along with other options to help maintain normothermia (FIGURE 2). Although using an incubator to warm the IV fluid bag before administration may seem like a good idea, most fluid pumps are incapable of delivering fluids at a rate that will not result in the fluid being at room temperature when it reaches the patient. Cooling begins the minute a bag of warmed fluids is removed from the incubator. Even with use of some type of insulation around the bag during surgery, cooling happens rapidly. But the real cooling occurs at the administration set. The average IV administration set has a priming volume of around 15 to 19 mL, which does not include the fluid held in the priming bulb at the top. Use of an extension set or T-port will add volume. If you consider an average 20-kg patient receiving fluids at 5 mL/kg/hour through a 15-mL IV administration set, the fluid will stay in the fluid line approximately 9 minutes (BOX 1). Because the environmental temperature of many surgery suites is in the 62°F to 68°F range (much lower than body temperature), 9 minutes is sufficient time for warmed fluid to cool to room temperature by the time it actually reaches the patient. For a cat, because of the lower flow rates, the fluid could be in the line for over 30 minutes! Inline fluid warmers are great for counteracting this heat loss if placed close to the patient. However, if the inline fluid warmer is close to the fluid bag, there is little to no advantage in using it. Placing the warmer close to the IV catheter, keeping in mind individual instructions on how close to the patient it can be, will promote heat conservation. This piece of equipment is easy to use and requires little maintenance to provide years of service. The following example shows how to calculate the length of time fluid stays in an IV administration set. A 20-kg patient is receiving fluid at 5 mL/kg/hour via an administration set with a 15-mL priming volume. Step 1. Calculate the fluid rate by multiplying body weight by fluid rate. Step 2. Divide the hourly rate by the administration set priming volume to discover how many times per hour the fluid in the administration set will be exchanged. Step 3. Calculate how many minutes the fluid will stay in the IV line by dividing 60 minutes by the times per hour the fluid will be exchanged. This calculation indicates that the fluid stays in the administration line about 9 minutes before it reaches the patient. This calculation does not consider the fluid in the priming bulb, which will increase the time that the fluid is outside the fluid bag and exposed to room air. Because the amount in the bulb will vary and is not considered in the volume of the administration set, it cannot be accurately calculated. FIGURE 3. 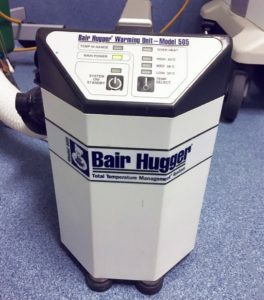 Bair Hugger unit. Image courtesy of Brenda Feller. Similar units have reusable blankets (FIGURE 4). 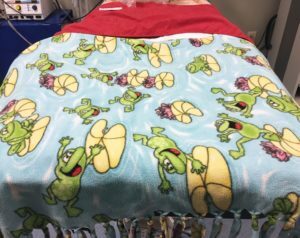 Cloth blankets can be purchased for use with forced warm air systems and laundered between patients. Follow manufacturer’s instructions for cleaning and use. When using cloth blankets, I have successfully placed a fleece blanket over the cloth blanket to trap heat close to the body if the warming blanket is placed over the torso of the patient. FIGURE 4. Forced warm air with cloth blanket. Image courtesy of Jorvet. If the surgeon is concerned about the circulating air these devices emit, one option is to start the unit after the patient is fully draped for surgery. Maintenance consists of changing an internal filter after a set number of hours of use. 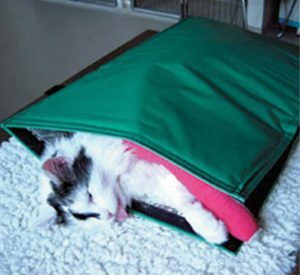 Other mechanical devices specifically designed for veterinary patients are conductive fabric warming devices (FIGURE 5). FIGURE 5. Space blanket–type device. Image courtesy of Jorvet. A product commonly used in veterinary medicine is the Hot Dog warming system (hotdogwarming.com). Conductive fabric warming devices do not blow hot air and have reusable blankets that can withstand cleaning. They have alarms that alert the team if the patient is overheated. Recently, the manufacturer has recommended replacing the blankets every 2 years. As always, follow manufacturer’s instructions. 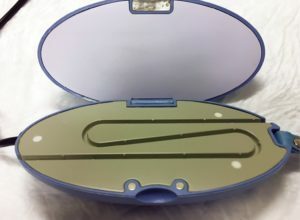 These devices consist of a pump that warms water (FIGURE 6), which is then delivered to a water blanket that can be placed over or under a patient (FIGURE 7). FIGURE 6. Warm water circulating pump. Image courtesy of Jorvet. One disadvantage of these systems is that the blanket is made of a plastic material and can be damaged by puncture. To avoid blanket puncture, you can purchase a product that can be placed over the blanket to protect it or use the product only after the patient is anesthetized. 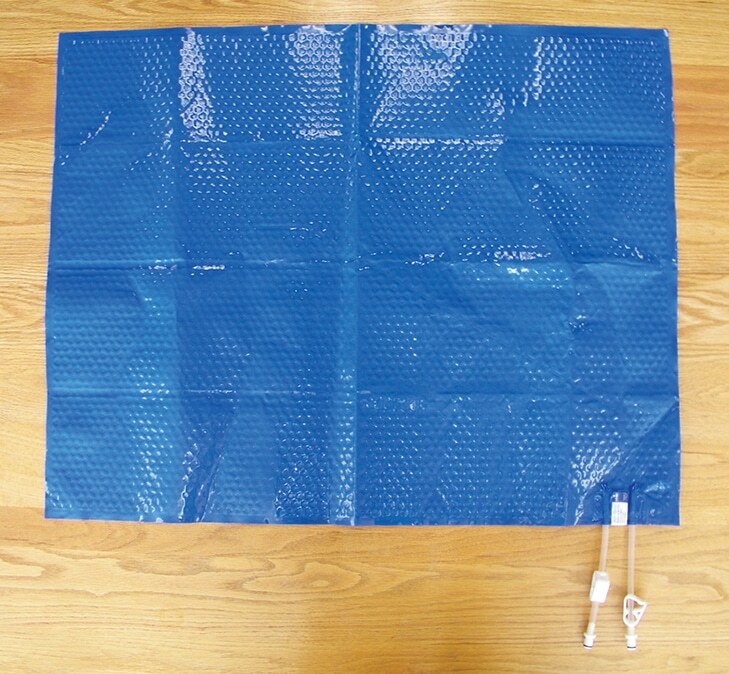 The warm water blanket can also serve as an inline fluid warmer if the IV line is run under the blanket. FIGURE 7. Warm water blanket. Image courtesy of Jorvet. It is important to note that using unapproved methods for heat support may cause thermal burns. Patients who experience thermal burns experience severe pain and protracted healing of burned tissue and, in severe cases, may require euthanasia. Unfortunately, I have witnessed all of these side effects from use of unapproved heating sources during anesthesia. There are many products on the market that are not safe for patients that are unconscious and unable to move away from the heat source. Unsafe products include any product that is placed in the microwave (eg, discs, hot water bottles, rice socks), no matter how well they are insulated. When the products are microwaved, there are no safeguards to monitor the actual temperature of the products. These products are acceptable when the patient has the ability to move away from the source if they are too warm but not when the patient is unconscious or heavily sedated.6 Never use an electric heating pad made for humans on a veterinary patient because of the risk for burns and electric shock. A wide variety of passive, or nonmechanical, methods can be used to help maintain a normal body temperature range in an anesthetized patient. Several items in this category are found in most practices. FIGURE 8. Layering, bubble wrap/towel. Image courtesy of Brenda Feller. Most practices have access to bubble wrap, which can be used in a variety of ways (FIGURE 8). It can be placed on a metal table, covered by a thick towel, to insulate the patient from the cold table and prevent conductive heat loss. Smaller pieces can be placed around limbs for insulation, or if the procedure is to be performed on a limb, the torso can be wrapped.2 Bubble wrap can be used in addition to some type of mechanical warming device that traps heat near the body. Bubble wrap should not be used on a conscious patient because of the risk of its being ingested. Bubble wrap should be discarded after use. Heat loss can be reduced by placing baby socks, sweaters, or any other type of clothing on the patient anywhere not involved in the surgery site. These items can be placed on the extremities or torso. Plastic wrap can be used for patients undergoing surgery on a limb. 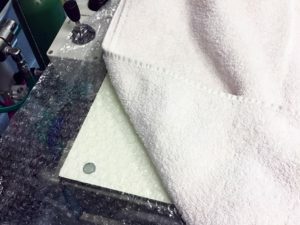 Simply covering the torso and the table, including a mechanical heat source like a circulating warm water blanket, will keep the heat produced by the body and the blanket contained within the plastic wrap. Patients undergoing dental prophylaxis should be kept dry to prevent heat loss through evaporation. An easy way to accomplish this is to place plastic wrap over the patient’s torso and then place a blanket over the plastic wrap. Plastic wrap should be used only for anesthetized patients. If plastic wrap is ingested by the patient, it has the possibility of becoming an intestinal obstruction. FIGURE 9. Flannel blanket. Image courtesy of Brenda Feller. 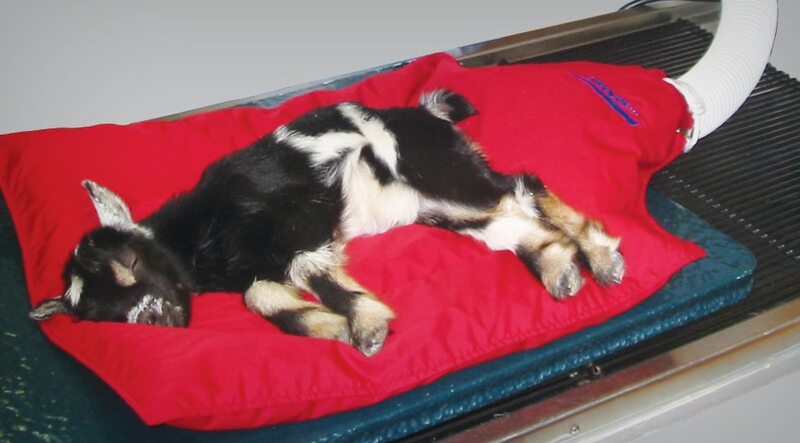 Flannel blankets and space blankets placed over the patient trap the warm air near the patient and can mitigate heat loss (FIGURE 9). For best results, cover all parts of the patient, including the head and extremities. Although blankets alone will not keep patients warm, they are a great addition to other methods. A high oxygen flow rate can contribute to hypothermia; however, this risk can be reduced if the oxygen flow rate is calculated for the patient instead of being set arbitrarily high. An oxygen flow rate of 20 to 22 mL/kg/minute, which is more than twice the normal oxygen demand for a patient on a rebreathing circuit, provides adequate oxygen flow and reduces the amount of cool oxygen delivered to the patient.4 This means that a 20-kg dog would require only 400 mL (or 0.4 L) of oxygen per minute. The caveat to this rule is that to ensure accurate delivery of the gas inhalant, all vaporizers have a minimum low oxygen flow rate. This information is located in the instruction booklet, or technical services can provide this information about the vaporizer. Until the minimum flow rate for a particular vaporizer is verified, for safety, a minimum oxygen flow rate of 500 mL/minute can be used. Nonrebreathing systems require a higher oxygen flow rate based on the weight of the patient (FIGURE 10). This rate will vary slightly among types of system and results in a 5-kg cat often requiring a higher oxygen flow rate (150 to 300 mL/kg/minute) on a nonrebreathing system than a 40-kg dog on a rebreathing system. FIGURE 10. Nonrebreathing circuit with warm water bottle on oxygen line. Image courtesy of Brenda Feller. FIGURE 11. Space blanket type blanket. Image courtesy of Jorvet. To prevent hyperthermia during the postoperative phase, active body warming should be discontinued after the rectal temperature reaches 98.5°F.5 However, a return of the patient’s body temperature to normal does not mean that the anesthetist’s job is done. The core body temperature can continue to drop. This phenomenon is called “afterdrop” and is a result of the cold peripheral blood being circulated back to the body core.5 The patient should be actively monitored until the body temperature is stable for 1 to 2 hours. Hypothermia is an often overlooked condition that is easier to prevent than to treat. If not treated in a timely manner, hypothermia can have grave consequences. Postoperative hypothermia can cause prolonged recoveries and increased wound infections. Better anesthesia outcomes can be achieved when we identify causes of heat loss, take measures to avoid or counteract them, and incorporate active warming into our surgical protocols. Ko J. Small Animal Anesthesia and Pain Management: A Color Handbook. London: Manson Publishing; 2013:154–155. Mosing M. General principles of perioperative care. In: Duke-Novakovski T, deVries M, Seymour C, eds. BSAVA Manual of Canine and Feline Anaesthesia and Analgesia. 3rd ed. Quedgeley: British Small Animal Veterinary Association; 2016:16–19. Anesthetic complications (Chapter 6). In: Shelby A, McKune C, eds. Small Animal Anesthesia Techniques. Ames: Wiley-Blackwell; 2014:226. Dugdale A. Veterinary Anesthesia Principles to Practice. Chichester: Wiley-Blackwell; 2010:313, 316. Oncken A, Kirby R, Rudloff, E. Hypothermia in critically ill dogs and cats. Compendium J 2001;23(6):506–519. Evans AT, Wilson DV. Anesthetic emergencies and accidents. In:Grimm K, Tranquilli W, Lamon L, eds. Essentials of Small Animal Anesthesia and Analgesia. 2nd ed. Chichester: Wiley-Blackwell; 2011:525. DaCunha AF. Neonatal, pediatric, and geriatric concerns. In: Snyder L, Johnson R, eds. Canine and Feline Anesthesia and Co-Existing Disease. Ames: Wiley-Blackwell; 2015:313. Moretti B, Larocca AM, Napoli C, et al. Active warming systems to maintain perioperative normothermia in hip replacement surgery: a therapeutic aid or a vector of infection? J Hosp Infect 2009;73(1):58-63. Bryant S. Anesthesia for Veterinary Technicians. Ames: Wiley Blackwell; 2010:75. Macintire, D. K., Drobatz, K. J., Haskins, S. C. & Saxon, W. D. Manual of Small Animal Emergency and Critical Care Medicine, (John Wiley & Sons), https://www.bsava.com/Resources/Veterinary-resources/Scientific-information/Animal-warming-products, accessed December 22, 2017. Which warming device is approved for anesthetized patients? NOTE Questions online may differ from those in the printed journal. Answers are available once CE test is taken at vetmedteam.com/tvp.aspx. Tests are valid for 2 years from date of approval.